JFD is the world leading underwater capability provider, serving the commercial and defence markets with innovative diving, submarine and hyperbaric rescue, technical solutions and services. JFD, the world-leading underwater capability provider serving the commercial and defence markets and part of James Fisher and Sons plc, is celebrating the delivery of the first two lifeboats which form part of JFD’s new safety-advanced range of self-propelled hyperbaric lifeboats (SPHLs). In February 2016, JFD won a multi-million pound contract to design and manufacture six SPHLs; four 18-man and two 24-man, as part of the saturation diving systems on board a new fleet of diving support vessels (DSVs). Final testing on the first two 18-man SPHLs has now been completed and they are ready for installation and commissioning following the launching ceremony held on 12 September 2017. These lifeboats mark the first to be completed as part of a new partnership between JFD and Vanguard to develop a range of next generation SPHLs and integrated davit systems which lead the way in terms of operational safety standards for saturation divers. The partnership combines JFD’s globally trusted chamber manufacture and design expertise with highly respected Singapore-based lifeboat manufacturer, Vanguard. JFD is now able to offer saturation system customers around the world a full range of SPHLs designed and manufactured entirely in-house, reducing associated integration risks and cost implications. By fitting the chambers with their Divex-brand product range, JFD not only assures clients that they are receiving proven and world-renowned technology, but can offer an un-paralleled servicing programme to maintain the equipment across its lifespan. Standard vessels are engineered to 12, 18 and 24-man configurations with built-in self-righting capability and can be rated down to 600msw based on customer specification however bespoke designs are also available. Ergonomically designed internal working areas and an environmental control system enhance safety, practicality and comfort for the marine and life support crew. JFD’s SPHLs can be supplied compliant with NORSOK, ABS, DNV, IMCA and Lloyd’s register depending on requirement. JFD was able to implement a global approach to the project by combining expertise from both its UK and Singapore facilities. This ensured engineering expertise, assembly efficiency and manufacturing costs could all be strategically aligned providing customers with a product that’s focused on both value and performance. “The delivery of these first two SPHLs is a huge milestone for JFD. Our highly experienced engineering and manufacturing teams have put in an incredible amount of hard work and dedication which has resulted in the production and delivery of two of the most safety-advanced SPHLs on the market. JFD, the world leading underwater capability provider serving the commercial and defence markets and part of James Fisher and Sons plc, has commenced a training programme for a team of 72 Indian Navy personnel on its new 3rd Generation submarine rescue systems, due to be delivered to the Indian Navy in March 2018. Under a £193m contract, awarded in March 2016, JFD is providing two complete flyaway submarine rescue systems to the Indian Navy, including Deep Search and Rescue Vehicles (DSRV), Launch and Recovery Systems (LARS) equipment, Transfer Under Pressure (TUP) systems, and all logistics and support equipment required to operate the service. The equipment will be designed, manufactured, integrated and tested by JFD prior to shipping in March 2018 for final commissioning and trials with the full, certified systems due to delivered to the customer in June 2018. JFD’s 3rd Generation rescue system represents a step-change in real world capability, incorporating an innovative new system design and tightly integrated components to ensure time-to-first-rescue (TTFR) – the time measured between system deployment and commencement of the rescue - is kept to an absolute minimum. TTFR is the most crucial element in a submarine rescue mission as reaching the distressed submarine (DISSUB) as quickly as possible maximises the chances of a successful rescue, and crucially, protects the lives of submariners. The JFD team has now begun conducting in-depth training with local teams of engineers to operate and maintain the systems, employing the knowledge it has gained through years of operating world-class submarine rescue services with navies across the world and creating an indigenous expert submarine rescue capability. This training will ensure that, in the event of a real emergency, the crew are prepared to mobilise quickly and efficiently to successfully effect a rescue with minimal TTFR. “Submarine rescue operations are high risk, and with human life at stake it is imperative that they are planned and executed professionally and efficiently. This programme will allow the trainees to learn all aspects of safe submarine rescue, from theory through to operation, ensuring they develop the breadth and depth of learning they will need to ensure they are able to protect the lives of submariners around the world. Training has been held at a specialist facility, The Underwater Centre in Fort William, with the first phase involving Indian Navy officers and sailors that will commence over a period of five weeks. This initial phase will cover chamber operation, ROV training and familiarisation, and in-water submersible training. After this initial period, JFD will continue training on the operation of submersibles, culminating in cross-training on its own Deep Submergence and Rescue Vehicle (DSRV), following sea acceptance trials (SATs). At the end of the programme, trainees will be experienced in the operation of a number of different submersibles and will be ready to undertake live rescue operations at sea. 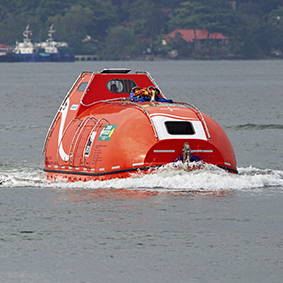 In order to enhance the training experience for the Indian Navy, JFD also teamed up with U-Boat Worx, which is providing its Super Yacht Sub 3, a three-person submersible, to allow the delegates to become familiar with submersible operations, ahead of more in-depth rescue submersible training. JFD, the world-leading submarine rescue and diving equipment company and part of James Fisher and Sons plc, is delighted to confirm that its new COBRA (Compact Bailout Rebreathing Apparatus) system has passed further trials rating it safe for use at depths up to 450msw. Released earlier this year, COBRA is a new bailout solution designed to replace conventional SCUBA bailout methods, providing divers with a greatly extended supply of breathing gas in the event of a primary supply failure. In July 2017, COBRA was granted CE marking status for use at depths up to 300msw making it the only approved system of its kind to fully comply with NORSOK U101 (Diving Respiratory Equipment) and EN14143 (Self Contained Rebreathing Apparatus) standards at this depth. The system has recently been subject to further pressure testing and has undergone rigorous assessments which have ensured it is safe for use at depths up to 450msw. This is an huge safety advancement for divers working within the extreme conditions experienced during the world’s deepest diving operations. This pioneering technology was developed by JFD in direct response to current equipment performance shortfalls at depths beyond 200msw. At extreme depths, traditional bailout systems offer divers less than three minutes of emergency breathing gas in the event of disconnected from his primary supply. COBRA marks a step change by providing up to 20 minutes at depths of 300msw and up to 10 minutes at depths of 450msw which greatly improves the chances of survival. As the only system on the market which provides this level of safety, JFD hopes COBRA will be adopted by diving contractors improving the safety of their divers by increasing the chance of survival in the event of a catastrophic failure of the primary breathing system. COBRA should become standard for saturation diving at all depths, not just for deeper diving, improving industry safety globally. Since launching COBRA, JFD has already received a number of orders from major diving contractors. COBRA (Compact Bailout Rebreathing Apparatus) has been developed to provide a simple, highly reliable breathing system which will offer a diver up to 45 minutes of fully independent breathing gas to return to the safety of the bell in the event of an emergency. The existing SLS has a "parachute" operation, while the COBRA can be mechanically switched on and off by the diver as a pre-dive check. The COBRA counterlungs are completely encapsulated on the diver’s back. The COBRA uses as easy fill scrubber system for fast, simple change out of sodalime. Increased positive pressure feed to allow more rapid descent. Smaller than existing SLS Mk4 backpack. Composite or steel twin cylinders easily accessible for charging. Single turn activation and no counterlung "ripcord". Safety indicator "rotowink" provides additional assurance of system positive pressure and hence integrity. The only commercial emergency rebreather system in the world to have been granted CE Marking status to NORSOK U101 (Diving Respiratory Equipment) and EN14143 (Self Contained Rebreathing Apparatus). Recent projects have seen JFD making several key technological advances in the design and build of saturation systems, which have significantly increased system efficiency for the operators, and safety and comfort for the divers. JFD designs are flexible and can be configured to suit a range of vessel designs and layouts, however the systems can be identified in two distinct categories - integrated and modular. Integrated saturation diving systems are typically built into a DSV during construction of the vessel in a shipyard. These tend to be larger 18-24 man systems and may employ two diving bells and twin SPHL’s. Modular saturation systems are designed to be deck-deployed on existing work vessels and can be quickly removed and re-installed on other vessels. These are typically 9-12 man systems with a single diving bell. JFD's National Hyperbaric Centre houses the only land-based saturation diving system in the UK for receiving hyperbaric lifeboats (HLBs). Capable of facilitating next generation 24-man SPHLs, the facility is one of the most capable in the world. JFD has had a historic involvement with lifeboat reception serving the industry since 1987 making us an obvious choice for companies looking for support in this area. Within our asset pool, we also have a portable 18-man Hyperbairc Reception Facility which provides a practical hyperbaric rescue solution for operators working in remote locations. JFD manufactures a range of Self Propelled Hyperbaric Lifeboats (SPHLs) which combine proven, high quality internal chambers and life support equipment with specialist hull construction. Designed to provide the highest level of safety and performance during an emergency evacuation, JFD SPHLs can be supplied compliant with NORSOK, ABS, DNV, IMCA and Lloyds Register based on customer specification. JFD SPHLs are engineered to 12, 18 and 24-man configurations rated up to 600m.